The world keeps hurtling through space, packed to the rafters with straight up crazy people. 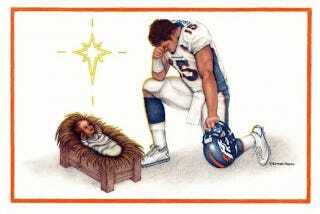 Behold: the Tim Tebow "Tebowing" Christmas card. Some Coloradan soul has gone to the trouble of creating a limited run of 1,000 of these bad boys so get them while they're hot (Five for $15). Once they're gone, they're gone! Unless...no that's not for a few more months still.